We mix, shape, proof, and bake our breads daily with the exception of two breads that improve with age. All breads contain some amount of starter (sourdough) – be it a pre-ferment for the egg and dairy-rich breads such as the challah or onion poppy rolls, or a whole wheat, white, or rye levain (French for sourdough) for all the others. These starters give the breads a more complex and often tangy flavor. 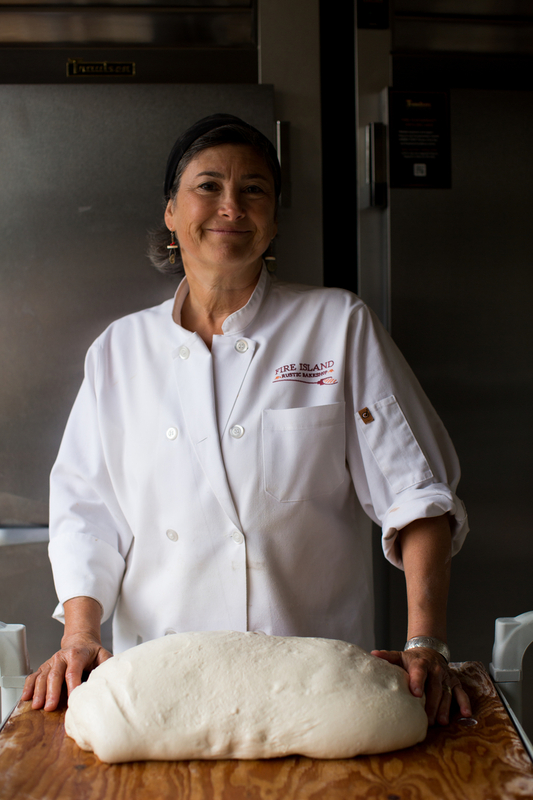 Our organic flour is from Central Milling in Utah – it is superb for artisan baking. They have their own bakery to test their flour daily for taste, color, and functionality. We like supporting a company that works directly with the farmers. Central Milling also generates their own electricity, powering their mill from a water turbine. 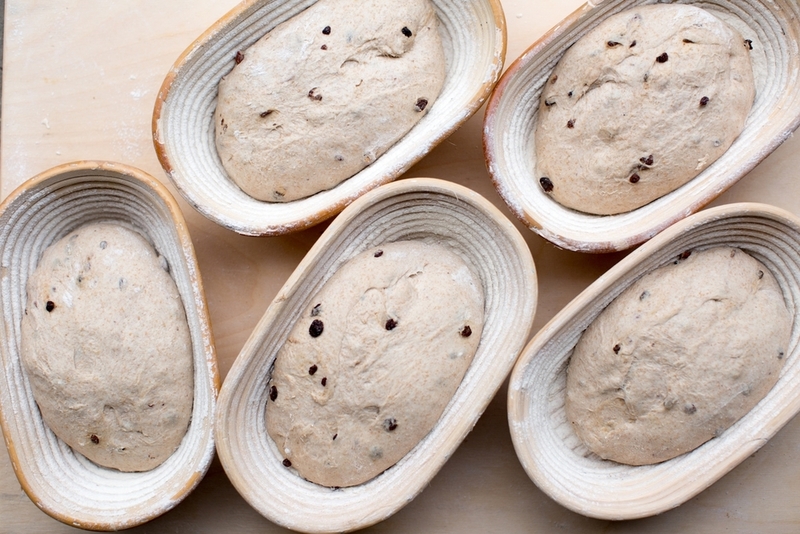 Caring for Your Bread: some steps to Ensure your bread stays fresh and delicious. Long Term Storage: If you plan to eat your bread days down the road, the best thing is to freeze it. Double bag your loaf and it can last up to 6 months in the freezer. Refreshing bread: Pre-heat your oven to 350F and bake 10 mins or until it smells like freshly baked bread. If you have a loaf that has been sitting on your counter for a few days, spritz it with water before refreshing. This will help the crust crisp up again. Slicing your bread: To keep the your loaf as fresh as possible, we recommend you slice as needed. The crust helps protect the soft crumb. Use a sharp, serrated knife using a long, light sawing motion. Let the knife do the work. Short Term Storage: The best place to store your loaf is in a paper bag or a bread box on the kitchen counter, cut side down. Breathable paper allows the crust to stay crisp. Refrigerators dehydrate the crumb and destroy the texture and flavor. Onion Poppy Seed Rolls These rolls are flavored with poppy seeds and freshly diced yellow onions. They are light, soft, and sized for burgers and sandwiches (they’re more than just a dinner roll). This is an enriched dough made with milk and butter. Pain Ordinaire Made from our wettest, longest fermented, old-world hand developed dough. This bread is made up of a blend of whole grain einka flour and high extraction wheat. Shaped into a 1 kilo miche. Rustic Wheat Our signature bread! Simply high-extraction flour, whole wheat levain, salt, yeast, and water that is mixed, proofed, and baked to create a wholesomely tangy loaf. Sliced Sandwich Bread Depending on the day, options include our Whole Wheat Pan, NY Rye, and our Prairie. Baguette A traditional French baguette is the signature of a bakery. It took us a year and a half to develop a baguette that we were proud enough to sell at Fire Island. We bake a traditional and a seeded version throughout the day. An obvious favorite for our baguette-a-day customers. Campagne Made with an aged levain to bring out the tangy, complex flavor, this bread contains organic white and wheat flour. Ciabatta Our sandwich bread is available in large loaves and rolls. An elongated, flattish Italian bread good for almost any use. Chewy with big holes make it an excellent choice to dip in a great olive oil. Focaccia An Italian flat bread untraditionally made with a type 85 flour that is lighter than 100% whole wheat but still very high in fiber. The focaccia is seasoned with extra virgin olive oil, salt, and various topping creations: sausage, cheddar, roasted potatoes, and egg; roasted vegetables and cheese; gorgonzola, walnuts, and green peas; roasted tomatoes, fresh mozzarella, and pesto; olives, feta, and roasted red peppers. Buckwheat Cinnamon Rolls Only buckwheat and whole wheat flours are used in our cinnamon rolls! Rich with sour cream, butter, and eggs, they are nut-free. Try them with or without maple cream cheese frosting. Baked on weekends only. Challah A traditional braided bread rich with organic eggs, milk, and butter. Always sold on Friday, fresh for the Sabbath meals. Available plain or sprinkled with poppy or sesame seeds. Made in a crown with or without raisins for the holidays. Currant Pecan Rustic Wheat Our Rustic Wheat recipe full of roasted pecans and currants. Emmer Einka Spelt A pan loaf containing emmer, einka, and spelt flours, emmer, einka and spelt berries, and sesame, flax, pumpkin, and sunflower seeds. This hearty loaf will be a welcomed addition to your backpack. Garlic Sea Salt Sourdough Our Alaska Sourdough loaded with roasted garlic and topped with Sitka sea salt. An incredible complement to a pasta dish with red sauce. Heirloom Corn Grits Sourdough Our Alaska Sourdough with an Anson Mill grit porridge added in. Perfect on its own, life changing with butter! Herbes de Provence Sourdough Our Alaska Sourdough infused with an aromatic blend of herbs including summer savory, thyme, rosemary, marjoram, fennel, and lavender. New York Rye A traditional NY-flavored rye made with onions and caraway seeds. A mixture of rye, whole wheat, and white flours. Olive & Rosemary Sourdough Our Alaska Sourdough loaf with Kalamata olives and roughly chopped fresh organic rosemary. Prairie A light pan loaf packed with seeds and other good grains (poppy, sunflower, flax, pumpkin, sesame, cornmeal, and oats). This sliced bread is excellent for sandwiches. Available Sundays only. Sprouted Grain This Alaska Sourdough loaf is packed with freshly sprouted Einka berries that give it a rich, nutty flavor. Sliced Whole Wheat A light pan loaf made from 100% whole wheat flour. Perfect for sandwiches! Vollkornbrot An old world wheat-free German rye bread that is dense, Pullman-shaped, and lasts for days. Ours is made from 100% pumpernickel flour and packed with flax seeds. Slice it thin and top with cream cheese and lox, or perhaps butter and apricot jam. European customers pair this with a strong cheese, tomato, and good stout. Whole Wheat 100% whole wheat sourdough loaf made with Edison wheat flour from Camas Country Mill in Oregon. This loaf is dark, tangy, and deliciously nutty.